The top of Pesagi Mountain is very magnificent; its height reaches 2.200 meters above the sea surface. The beauty and originality of the nature that surround the Pesagi Mountain is very well preserved. From the top of the mountain, visitors can enjoy the beauty of West Lampung, Ranau Lake, the OKU society`s residents, and Krui and Belimbing high seas. The top of Pesagi has a challenging hiking route. In the route, hikers can find kinds of orchid and wild fauna like birds and beasts. Anyone across the territory is not allowed to pick and take flowers or hunt animals. All hikers must participate for preserving the environment, littering is strictly forbidden. Legend has it, at the top of Pesagi Mountain, there were seven wells, which one of them sometimes produced a good aroma like perfume. Not all people could take water from that special well. Local people said, that only “pure intentioned” hikers could get water from the well. Hikers who did not have respect for nature or did not have good intention, would not get the water. 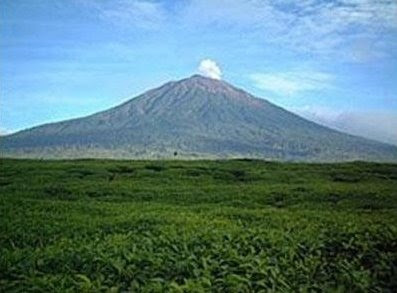 The top of Pesagi is located in Pekon Hujung (Hunjung village) territory, Belalau sub-district, Lampung Barat District. To get to the top of Pesagi, there are two routes that tourists can choose to take. The first route is from Pekon Bahway, ends in Pekon Hujung. This normally takes 12 hours round trip on foot. The second one is started in Pekon Hujung and ended from Pekon Hujung. Just like the previous route, this one also normally takes 12 hours in normal weather condition. If it rains, it takes more than 12 hours on foot.